Has HQ Trivia built the steampunk future of game shows? More than a million people take part in a 20 minute game show every day. The novelty? It's not on tv. HQ Trivia, the quiz sensation I'm talking about, happens on mobile only. It is radically new, but has an air of nostalgia about it. A bit like how the steampunk movement blends modern technology with Victorian Age aesthetics. 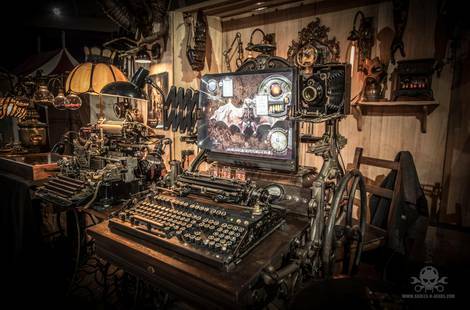 A steampunk computer, doesn't take much imagination to picture a 19th century settler using it. HQ Trivia doesn't take you back quite as far, it's more reminiscent of eighties television. When 'appointment viewing' was the norm: you knew when your favourite game show would air, and you'd make sure you were sat in front of the box in time. The theme tune warmed you up for the excitement to come. You loved or hated the presenter, but you felt like he was a friend of the family either way. The silly answers some contestants would give, made you look forward to talking about the show at school or work the next day. These elements are all present in HQ Trivia. Except for the real old-school appointment viewing. The app sends you exactly 1 push notification when the show is about to start. That way, you don't need to remember to tune in. A modern twist to the plot is that the show sometimes starts half an hour later, or suddenly organises an extra game. That small level of unpredictability keeps you on your toes: 'oh, it's past HQ Trivia time, would it not be on today?' When the push notification does come through, you'll tune in with extra anticipation. There is a theme tune when you're waiting for the show to start, but more habit building are the tips that are always shown before the game: 'connect to a power source', 'find good WIFI', 'turn up the volume'... The simple repetition brings you in the mood for 20 minutes of undistracted fun ahead. The presenter looks and sounds slightly anachronistic, but in doing so is extremely contemporary. With his somewhat overdone studio make-up, nicely combed hair and respectable suit, he talks to you directly from his tiny purple, yellow, pink and green studio (did I mention the eighties feel of the show yet?). His jokes are not exactly funny, but not appalling either. He mentions current things like golden lattes enough to make sure you know you've not been teleported back in time. What is entirely new, is that you play the game. Should you win, you win real money. You have to share with the other winners though, so $2,500 might actually become $7,71. Still, it's not simply playing along with the 'real contestants' in the studio, in HQ Trivia you are the real contestant. I was one of the winners on @hqtrivia today, and let me tell you, it is such a confidence booster. I feel unstoppable. And you're out as soon as you get one question wrong. Extra lives can be achieved by getting people to download the app using your code, but even with an extra life the game is brutal. Seeing how many players are wiped away with each question makes you want to continue watching even when you're out. You hate it when you get more answers right after the one that killed you, and you wonder how far the people you know got. You promise yourself to do better next time. In short, you're hooked. Got knocked out at Q10, but carried on watching, would’ve won if it wasn’t for that one question! Furthest I’ve ever got on @hqtrivia !! For many people playing HQ Trivia, the show doesn't feel nostalgic at all. For hundreds of thousands of people, it's completely new. Their tender young ages prevent them from having lived through the drudgery of the eighties. Still, even for the +35's amongst us, the show is completely new in many ways. HQ Trivia has been heralded 'the first true digital show', and I tend to agree. The relationship between TV and mobile viewers has been in the 'it's complicated' zone for ages now. Then, there was a brief stretch during which audiences were asked to use the Red Button on their remote control. That didn't work very well, nor very long. We had to wait for the first second screen apps for a new layer of interactivity. Those layers might have been more meaningful, but even though many producers and many app builders put a lot of effort and creativity in second screen apps, they never really took off. I should know, having built quite a few of them. We'd get a 10% interaction rate, at best. So, what is the big leap between second screen apps and HQ Trivia's triumph? The biggest difference is the digital first approach. The show doesn't air on TV. After decades of trying to use the possibilities of mobile and digital to enhance the existing experience of linear TV, the makers of HQ Trivia rigorously cut the cord with 'regular' TV. When you play, you don't feel like you're watching TV. You immediately feel that the format is made for the device you're holding. The little jolts of haptic feedback you get from your phone when time is up, even feel as if your device is happy that you're using it for something it's made for. Another game changer (couldn't resist) is that the game is 100% live. There is something very appealing about getting together with a group. I think it might go back to us as hunters and gatherers sitting around the fire at night, but I've got no scientific data to support this hypothesis :-). When HQ Trivia is on, colleagues and family members stop what they were doing and and play together. Even when you play by yourself, seeing the messages of other players that roll over the screen makes you feel part of the gang. The game has been on for about 6 months now, and of course many people are looking at the format to see what they can do with it. Having built similar games before, at Zender we firmly believe there are great things to be done with the format. Country-specific versions for example. Most people outside of the US who have downloaded the app will have learned the hard way that American trivia is, well, very American. Or formats for specific audiences, a live trivia game for teenagers, or for football fanatics. However, I think we should see HQ Trivia as a big step in the evolution of digital entertainment, but not as the end goal, or the one format to kill 'm all. I'm sure we'll be seeing more radically new formats see the light of day soon. If you're interested to discuss your version of HQ Trivia, let me know. I'll take you on a guided tour of Zender, our SaaS platform for creating and managing digital live formats. In our Grand and Growing Catalogue of Digital Live Formats, the trivia quiz format is currently the center piece. Let us know if you want to publish your version of it, we've got the editorial and technical challenges covered.